Welcome to Cane & Basket Supply Co. established in 1934. Since then, we have made every effort to obtain the finest quality and largest selection of cane, bamboo and related products used for weaving and decorative purposes. We take pride in our friendly, helpful and prompt service. Our years of experience, into a second generation, enables us to help you with the application of the product, whatever your need may be. For those of you who don't want to do the work yourself, Cane & Basket Supply has a fully staffed repair and installation department with over 200 years combined experience and knowledge. We can repair your chair or build you a hot air balloon basket. (3) largest, most complete selection of easy-to-work with quality materials. 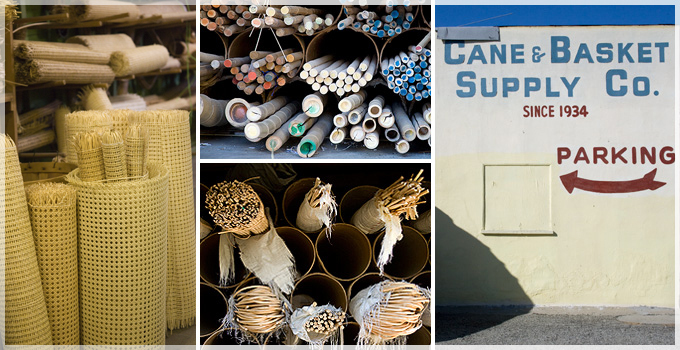 In addition to these supplies, Cane & Basket Supply Company provides the largest repair business in the West. All materials offered in this catalog have been tested for quality and usability before being offered for sale. If you have any questions, please feel free to email, phone or come in. It will be our pleasure to help you with your needs.